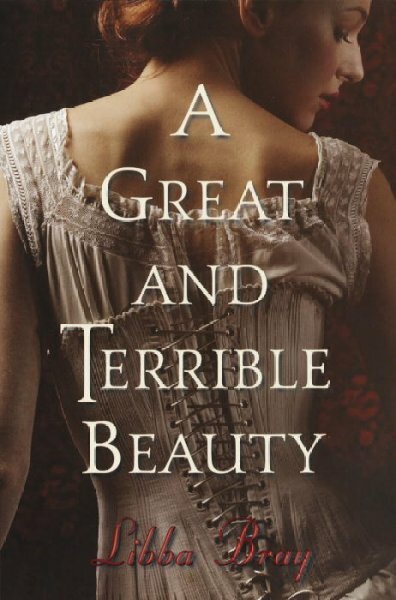 A Great and Terrible Beauty by Libba Bray, set in 1895, tells the story of stubborn Gemma. After her mother’s murder, Gemma is sent to a boarding school near London. She has strange visions and in one a little girl gives her the diary of Mary Dowd. Gemma discovers that Mary has visions like hers. Gemma makes friends with power-seeking Felicity, imaginative Pippa and bullied Ann. As Gemma’s visions grow into magical powers, life at the boarding school gets worse and worse. This fantasy story is full of adventure, romance and secrets. The complex characters and mysteries bring the story to life as the secrets unravel. – Written by TAB member Sabine P.
The World has ended. Arthur Dent, the only human left, has been rescued by an alien who goes by the name Ford Perfect. To escape being killed in the Earth’s destruction, Ford and Arthur sneak on the Vogon alien’s spaceship. The Vogons find them and, after reading some of their poetry to Arthur and Ford (a painful method of torture because Vogon poetry is the third worst in the Universe), they throw them out into space. Just before they suffocate, Ford and Arthur are picked up by the Infinite Improbability Drive – a valuable spaceship stolen by the President of the Imperial Galactic Government. Ford and Arthur meet smart, levelheaded Trillian; Zaphod, the crazy President of the Imperial Galactic Government and Marvin, the depressed robot. Together they go on an exciting adventure to discover a planet and the meaning of life, the universe and everything. This hilarious story is full of coincidence, randomness and adventure. The unique characters and unpredictable plot will take you on a journey through the universe. The Wanderer by Sharon Creech is a beautiful story of identity told in diary entries. Sophie has always loved the sea. She has three parts to her personality. The dreamy side, the logical side and the stubborn, impulsive side which is the one she uses to convince her family to let her get on a boat and sail to England with them. 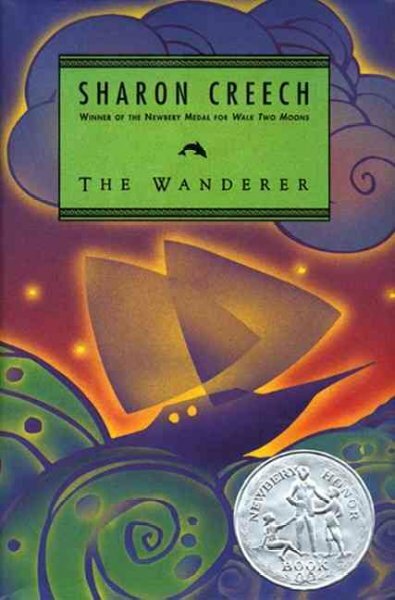 Leaving her parents behind, Sophie gets on her uncle’s boat named The Wanderer with her three uncles and two cousins. At first only Uncle Dock appreciates Sophie. Uncle Stew and his son Brian are super organized and constantly make lists and get on everyone’s nerves by bossing them around. Sophie’s uncle, Mo, doesn’t do much besides yell at his son Cody and sit around drawing. Cody, writing the other half of the book as a homework assignment, is “charming in a dangerous sort of way.” He fights a lot with his dad but makes a lot of jokes. He purposely mixes up sailing terms and everyone wonders if he can ever be serious. As they sail to England, Sophie struggles to accept her past and Cody wonders if he can prove himself to his dad. This exciting story is full of mystery and adventure as these wonderful characters and Newbery Award-winning author will take you on a journey you won’t forget. Joey Margolis, a Jewish 12-year-old living in 19 40 is a smart kid but behaves badly in school and is constantly beat up by other kids. With his parents divorced, Joey lives with his mom and Aunt Carrie and almost never sees his dad. Joey faces many problems and is in need of a father figure in his life. He writes a letter to Charlie Banks, third baseman for the New York Giants. After many letters in which Joey tries to convince Charlie to do stuff for him and be his friend and Charlie tries to convince Joey to stop writing, Joey wins and they become friends. As Joey faces more problems, Charlie becomes the solution. When Joey’s dad can’t come to Joey’s Bar Mitzvah, Charlie takes his place. In this wonderful story, told entirely in letters, newspaper articles and telegrams, Joey and Charlie’s feelings and backgrounds shine through their arguments and smart-alec comments to tell the story of friendship and love. –Written by TAB member Sabine P.
How many times have you looked away when you passed that kid in the hallway at school who doesn’t have many friends, is teased and gossiped about? Nineteen-year-old Ed Kennedy hasn’t accomplished much in life other than a lot of card games. He’s a cab driver who lives with his dog, the Doorman. He has three good friends: easy-going Ritchie, outspoken Marv, and Audrey, whom Ed is hopelessly in love with. When Ed gets the Ace of Diamonds in the mail with three addresses written on them his life changes. At each address something happens. A lonely old women waits for her husband , who died 60 years ago, to come home. A teenage boy is a bully at school and is repeatedly beat up by his brother at home. Ed’s job is to help each of these people. Ed doesn’t know who sent him the playing card but he’s determined to continue his life changing tasks. This touching story will convince you to smile at that kid next time you see him in the hallway. Have you read Frankenstein by Mary Shelley? Then you should definitely read This Dark Endeavor by Kenneth Oppel. This Dark Endeavor is a prequel to the famous Gothic fiction tale and is a fantastic book. It tells the story of Victor Frankenstein at age 16, living happily with his mother and father, two younger brothers, adoptive sister, Elizabeth, and identical twin brother, Konrad. But one day everything changes when he, Elizabeth and Konrad stumble upon a secret passageway behind a shelf of books in the library. The passage leads to an archive of ancient alchemical books behind a rather disagreeable door. Victor becomes obsessed with alchemy and the hidden library, and when Konrad contracts a possibly fatal illness, Victor is sure that he can recreate the Elixir of Life, a potion that is said to be the cure to any ailment. With Elizabeth and his best friend Henry at his side, Victor sets off on a dangerous quest to save his brother, battling vultures, giant fish, his feelings for Elizabeth, and the awful question of whether the elixir actually works, or is simply a foolish fantasy. This book will captivate your attention until the very end, and leave you scrambling to get your hands on the second installment, entitled Such Wicked Intent. Happy reading! -Written by TAB member Annalise L.
No one is exactly the same and not everyone fits in, especially in middle school. The Misfits by James Howe features a unique group of friends who call themselves the Gang of Five, even though there are only four. Bobby, the narrator, is overweight and his mother died of cancer when he was younger. Addie is tall, smart and outspoken. Colorful and fashionable Joe is gay and Skeezie is the tough, leather jacket type. All four are labeled and called names but they stick together and their funny, loveable personalities are more than what meets the eye. Addie decides to run for student counsel at their small middle school in Paintbrush Falls, New York, but the group faces many problems being the misfits of the school. Even the teachers won’t let them run. Meanwhile, Bobby sells ties for the dreaded Mr. Kellerman or “Killer Man.” He also has a crush on a girl but doesn’t know how to tell her. The kids continue to get bullied but want to do something about it. This touching, laugh-out-loud book is unforgettable and leaves you with a smile on your face and tears in your eyes. There is a special place in my heart for the Gang of Five. -Reviewed by TAB member Sabine P.
Have you read the Mortal Instruments series? Then you should definitely read Clockwork Angel by Cassandra Clare! It is a fantasy book that is the first in a trilogy of prologues to Cassandra Clare’s bestselling Mortal Instruments series. It takes place in 1878 London, and follows the main character, Tessa Gray, through her adventures with the Shadowhunters (people who hunt demons) of the London Institute. When Tessa receives a steamer ticket from New York to London from her older brother, she doesn’t expect to find out that her brother has been kidnapped by two Sorceresses called the Dark Sisters, who will kill him if she doesn’t do exactly what they tell her. Neither does she expect to uncover an incredible, yet frightening, talent, or meet the mysterious Will Herondale, who has hidden his past even from his best friend. Clockwork Angel is an exciting mix of magic, mystery, action, suspense, and romance. It is a must-read even for those who have not read the Mortal Instruments. Enjoy! -Reviewed by TAB member Annalise L.
Wonderstruck by Brian Selznick is two captivating stories. One is told in words (Ben’s) and one in pictures (Rose’s). Ben’s mother has recently died and he’s living with his cousins at Gunflint Lake, Minnesota. He has never known his father and wonders about him because his mother never talked about him. Ben is deaf in one ear but uses it to his advantage.One night, caught in a storm while visiting his old house, Ben discovers a book and a bookmark that will send him on an exciting and unpredictable journey to discover himself and his father. Told completely in pictures, Rose’s story is a dramatic one. She runs around New York by herself, even though she looks only around 10-years-old. Selznick portrays so much in just one image. His detailed drawings left me wonderstruck as I turned each page. As Ben and Rose’s stories come together Wonderstruck gave me a new way to look at the world. I highly recommend it. So begins Kenneth Oppel’s creative, other-worldly novel, Airborn. Matt soon meets the rich Kate De Vries, a passenger on the Aurora. She is a strong, stubborn character with a passion for science and books. A pirate attack causes a problem with the Aurora and things are not looking good for the airship. Matt is having trouble staying loyal to both his captain and Kate. This is an exciting and unpredictable story. As soon as circumstances seem to be getting better, there is a turn for the worst. Airborn also demonstrates the beauty of nature and things untouched by human civilization. As Matt and Kate discover, there are places where very few have ever been and even fewer have returned from. This plants a spark of hope and imagination in reader’s minds to hear of such places as Oppel beautifully describes. 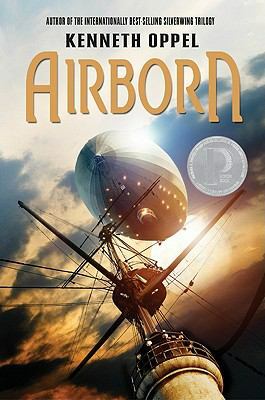 There’s a little of everything in Airborn: romance, adventure, mystery, an exciting trip to lost islands, flying pirate ships, and many other secrets in the sky.